← A Wonderful Story of a LOST LOVEY FOUND!!! I think this one from eBay is very similar. It’s a Dakin from 1981 same color with three kittens, only they attach as if nursing with Velcro and do not go in the tummy. That’s the closest I have found so far. She is making incredible progress! Due to a stroke after the surgery she needs physical therapy to strengthen her left side and to help walk but is definitely gaining that strength. She has a speech therapist and is making progress there too! She just had eye surgery which cleared her vision in her left eye. The doctors say she should make a 95-100 percent recovery which is totally amazing! Thank you so much, I really do appreciate all of your help! Please help if you can. My mother recently suffered a brain aneurysm and we do not know her prognosis. When she was little her favorite toy was a stuffed cat with Velcro a ZIPPER tummy that had kittens inside. Mom is 55 years old, so I imagine the cat was in production 45-50 years ago. I think it would help her to have her kitty by her side again. 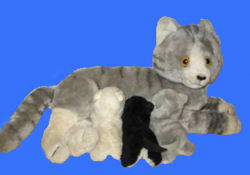 I don’t have a picture of the cat, but I remember that it was gray and in a laying position. It was one of the more realistic looking stuffed animals for the time (1950’s). I don’t know if that will help. I have even searched for a cat that looks similar so that I could add the tummy and kittens but I have not had any luck. She lived in the Los Angeles area, San Gabriel I think… if that helps. Thank you, I really appreciate your efforts. Are you talking life size? Just needed a bit more info. is this kind of what you are looking for…. I’ve not been able to get much of a description from them. Sorry, Tammi, but thanks for looking. I sent the link to the lifelike one. I know I would enjoy stroking it. The problem is the inside is hard, so it might not work. I should be thanking you, Tammi. This site would not work without people like you helping out. I did get your email suggestion, and am mulling it over. rosemary…. should i not leave an email address? since you have it? No, don’t leave our address, Tammi. Others should leave it in the form of xxxATxxxDOTxxx to lessen spam bots harvesting your address. wow you found it Katty. I hope they are the ones who won it. I sent that link to her, but she said it looked scary – I’m inclined to agree. LOL!! Anyhow, I gave her the link to Susan’s Sewnique. I think she will have better results getting one made. By the way, her mother is better!! There was no velcro in the 50’s… maybe it had a zipper? Good point. I haven’t written her in a long time to see how her mother is doing. She may not even be searching for it anymore. I’ll try to get an update and post it. I looked up the history of Velcro, and it’s fascinating. The inventor actually started working on his idea back in the 40’s, but it did not become a common household product until considerably after the astronauts used it.